Star Wars Celebration, being the galaxy-engulfing behemoth that it is, has had its share of hyped reveals and trailers this year. But there have also been some genuinely cool little moments. I’d definitely call this one of them. 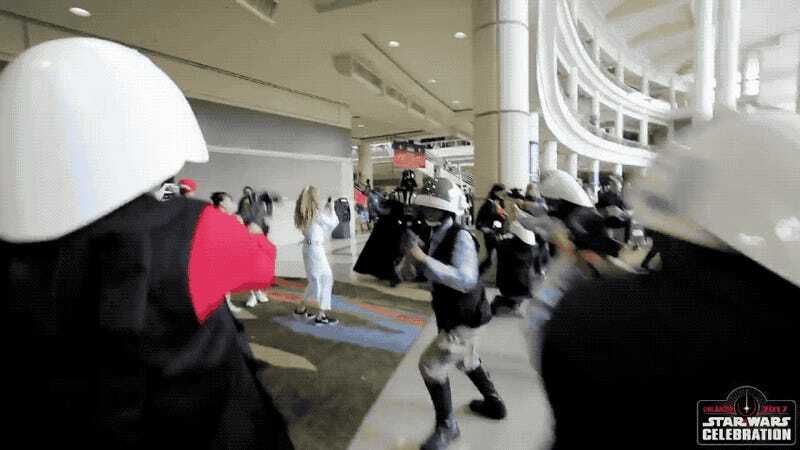 The Star Wars UK Twitter shared a video of a group of cosplayers and fans recreating one of Rogue One’s most dynamic scenes: Darth Vader’s final battle. Replacing the Death Star plans with a debit card (one of the most coveted items at any convention), it follows the rebels as they race away from Lord Vader through the convention to get the plans safely to Princess Leia. This short video isn’t anything particularly new or groundbreaking, but it represents one of the many reasons why it’s great to be a Star Wars fan. At any time or any place, a group of strangers can get together and make their own movie magic, using nothing but their shared fandom (and what looks to be an iPhone camera). On top of it, it’s just a lot of fun. Be sure to check out io9's recaps of everything amazing that happened at this year’s Star Wars Celebration (with more to come), including the first teaser trailer for The Last Jedi, the touching tribute to Carrie Fisher, and a look at Star Wars Battlefront II’s new solo campaign.